Dr. Eugenie Brunner examines the benefits of a minimally-invasive face and neck contouring procedure called SmartLipo Triplex™. 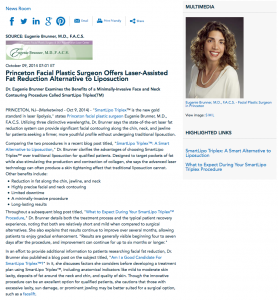 Princeton, NJ — “SmartLipo Triplex™ is the new gold standard in laser lipolysis,” states Princeton facial plastic surgeon Eugenie Brunner, MD, FACS. Utilizing three distinctive wavelengths, Dr. Brunner says the state-of-the-art laser fat reduction system can provide significant facial contouring along the chin, neck, and jawline for patients seeking a firmer, more youthful profile without undergoing traditional liposuction. In an effort to provide additional information to patients researching facial fat reduction, Dr. Brunner also published a blog post on the subject titled, “Am I a Good Candidate For SmartLipo Triplex™?” In it, she discusses factors she considers before developing a treatment plan using SmartLipo Triplex™, including anatomical indicators like mild to moderate skin laxity, deposits of fat around the neck and chin, and quality of skin. Though the innovative procedure can be an excellent option for qualified patients, she cautions that those with excessive laxity, sun damage, or prominent jowling may be better suited for a surgical option, such as a facelift. A graduate of Robert Wood Johnson Medical School—The University of Medicine and Dentistry of New Jersey, Dr. Brunner is certified by the American Board of Facial Plastic and Reconstructive Surgery and the American Board of Otolaryngology. She completed extensive training in otolaryngology at New York University Medical Center and a fellowship in Advanced Cosmetic Facial Plastic Surgery at the University of Toronto. A recipient of numerous accolades, Dr. Brunner was twice voted one of New Jersey’s favorite physicians in the Vitals Patients’ Choice Awards. She is available for interview upon request. For more information about Dr. Brunner’s practice, please visit brunnermd.com and facebook.com/BrunnerMD.